The SKII is a clear, two ply bass drum head. This two ply Super-Kick version provides extra durability and a more focused sound than other . 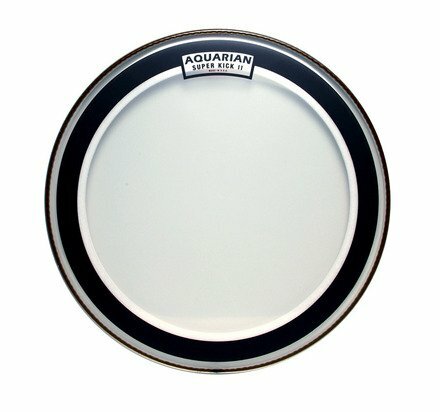 The Aquarian Super Kick II ( SKII) bass drum head fills the need of drummers who want that big and punchy, controlled bass drum sound without the use of blankets, pillows or external muffling. The two layers of 7 mil Nu-Brite drumhead film act as one single, durable membrane thanks to Aquarian's multi-ply vacuum molding process. The patented "Floating Muffling System" is made of felt for a pre-dampened, yet natural sound. The felt moves and "breathes" with the drum head. Often imitated, never duplicated, the Super Kick II is a best seller and a favorite of those drummers, drum techs and recording engineers who want a great bass drum sound without all the extra work. Available in clear and texture coated versions.